Ironically enough, I wound up loving Child of the Prophecy more than its predecessor, Son of the Shadows. For many, this original concluding foray into Sevenwaters was a disappointment, sadly lacking in comparison to the beauty that was Daughter of the Forest and the epic that was Son of the Shadows. As someone who left the latter feeling more than a little disappointed and was prepared to feel the same way from this installment, Child of the Prophecy proved to be a pleasant surprise. A very pleasant surprise. I wound up devouring this over a brief weekend in NYC, unable to set it down on the subway, train, or bus. And yes, I did get many strange glances at my oft grief-stricken expression, not to mention the stray tears, but it was so, so worth it. If, like me, you've been putting off this series under the assumption that this novel is the weak link, let me convince you otherwise; truly, it isn't. What makes Child of the Prophecy a difficult novel to like is the fact that it is a difficult novel to enjoy. Sorcha and Liadan, our past heroines, are women who have grown loved and sheltered in the woodlands of Sevenwaters. Fianne, however, has grown up secluded near the ocean with only her father. Niamh, Fianne's beautiful mother, committed suicide shortly after Fianne was born and, as a result, Fianne has always wondered why she was never enough to keep her mother alive. Furthermore, Fianne's limp and sorceress status keep her secluded from others; all except Darragh who patiently befriends her and loyally returns for her every summer, though he is a traveling man. As such, from the beginning itself, Fianne is a very different heroine, one whose path does not merely lie in testing her endurance, but also in discovering her own path. Our novel truly begins, though, when the Lady Oonagh, Fianne's grandmother, blackmails her granddaughter into infiltrating Sevenwaters and preventing a prophecy from coming true. Johnny, the son of Liadan and Bran, is the titular child of the prophecy upon which the hopes of Sevenwaters lie as they face a perilous time nearing war with the Britons, specifically the Northwoods who neighbor Harrowfield. Fianne, though recognizing the evil intents in her grandmother's plan, is powerless to stop her as the Lady Oonagh threatens to kill Ciaran, Fianne's father. Thus, Fianne travels to Sevenwaters, little realizing that her extended family of aunts, uncles, and cousins will fill her heart with love and weaken her resolve. Fianne, who has known little of love in her life and has seen its destructive hand in her family, will now discover the true power, both of family and, most importantly, of love. Fianne, from the beginning itself, was a protagonist I loved, merely because of her flaws. Unlike Sorcha and Liadan, Fianne is not without her evil attributes. In fact, on more than one occasion Fianne commits acts with terrible consequences, choosing not to intervene and prevent certain actions from unfolding. While this may indicate the presence of evil, what it really indicates is a character who is confused and afraid. Fianne fails to see her own beauty, both outward and inward, and also fails to recognize the power she holds. All these qualities make her an easy pawn for the Lady Oonagh and the struggles Fianne must face mold her character into one with many, many grays. It is difficult to decide if Fianne can even be considered a good person after all the evil she has done, no matter the good she does as well, but these are the precise reasons I love her character so. Fianne is not the perfect heroine Sevenwaters usually gives us. Along her way she finds way to defy her grandmother, to stand up to her and to stand up for what is right, and though she returns to being a pawn, time and time again, each time she learns and her experiences steadily give her the confidence she needs in herself to finally overcome evil. Without a doubt, Fianne's growth as a character is the best this series has delivered so far, and likely will be for her circumstances lend themselves to so much room for improvement. Fianne's steady will, her courage and determination to find a way to do right while leading her grandmother to believe she is doing wrong is such a tricky and difficult path, but she treads it realistically, with equal parts despair and hope. Although I was not comfortable with some of the decisions she was forced to make at the hand of her grandmother, I recognized their worth in her growth as a human and, ultimately, appreciate their value. Marillier wouldn't be herself, though, without rich secondary characters as well. We meet almost the entire Sevenwaters cast again, sans Red who has sadly passed away by this point, and are exposed to the changes that have taken place in the past eighteen years. While our favorite characters remain the same, time has changed them and their circumstances as well. Additionally, there is a slew of new characters, all in the form of Fianne's numerous cousins, all of which I loved. Yet, the secondary character who stole my heart - and Fianne's too! - was Darragh. Darragh and Fianne are childhood friends and while Fianne cannot see it, Darragh slowly falls for her with time. Now, however, entrusted with the Lady Oonagh's deadly task, Fianne sends Darragh away, fearful that her grandmother may threaten to harm him next. Thus, Fianne and Darragh are often apart for most of the novel. Although Darragh always returns to Fianne, their moments are short and their romance is not an overwhelming majority of the novel. In fact, I'd go so far as to say that this is perhaps the most subtle of Marillier's romances, but one of the most beautiful nevertheless. While Darragh and Fianne are kept apart, their memories of one another never are and through small thoughts and subtle gestures, the longing these two share is built-up. Although I don't parade as a hopeless romantic, the truth it, the sheer longing and uncertainty and love and affection between these two had me shaking with emotion near the end of the novel, despite the lack of emphasis it was given in the book. Darragh's kindness and his love give Fianne the strength to persevere on and while he isn't a leader like Red or Bran, his innocence and gentle nature are exactly what Fianne need, not to mention his loyalty and undying faith in his best friend, despite the horrors she confesses to him. For me, at any rate, these two definitely join the ranks with Sorcha & Red and Liadan & Bran. Without a doubt. While Child of the Prophecy was a surprisingly quick and engaging read for me, it did have its low points. For one, the portrayal of the Lady Oonagh was disappointingly Disney-like for my tastes. After shrouding this evil sorceress for two novels and building up her legend, actually meeting the woman was a disappointing shock. Marillier failed to convey the true hatred that resided within Lady Oonagh's heart and her dialogue depicted her as a blood-hungry witch. Additionally, the death of a major character, both from Son of the Shadows and this novel, was dealt with very sloppily, in my opinion. For fear of spoilers, I won't mention any names, but this character and Fianne shared a large story line, one that was integral both to Fianne's growth and the plot of the novel. Thus, to see the character killed off in a quick and hurried fashion, mostly as a matter of convenience, was confusing, to say the least. 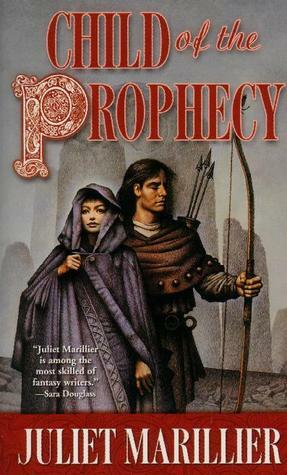 In some ways, this novel didn't carry forth the same level of well-rounded excellency as Marillier's novels always do, with a few points shoddily disregarded or merely disappointing, but ultimately, one cannot deny that Child of the Prophecy is an excellent conclusion to this original trilogy. Not only did it exceed my expectations, but it wormed its way into my heart as well. Well and truly, Child of the Prophecy is far from being the disappointment of this series. In fact, I suspect there isn't one to be found. You can read my reviews for Daughter of the Forest and Son of the Shadows, Books 1 & 2 respectively, HERE and HERE. I tend to react pretty strongly to deaths that I don't agree with, which make me worry about this book ever so slightly. I'm glad to see that you enjoyed it though, and even more than the last one. I have Daughter of the Forest on my wishlist and think I will have to treat myself to a copy later this year. ;) Brilliant review as always, Keertana! I definitely need to read something by this author Keertana, I know you just love her. Even with the few flaws you mentioned, it clearly was still a solid read for you. I'm a little nervous about the character death you mentioned, I don't like it when people I'm attached to get killed! Unless it's a bad guy, in which case I wouldn't feel so bad. Guess I'll just have to read and find out, huh? I really want to read some of her books! I recently received the 2nd book in her new series, so I need to get around to the first one asap! Okay, Wow. If I'm honest, I've avoided this novel b/c it hasn't seemed as strong as the first two and I'm afraid that I won't be able to connect with this heroine. However, I would really like to see Marillier work with someone who is unlike Sorcha and Liadan, and make me like them despite their flaws. I also am a huge fan of character growth and am eager to see that. Plus the fact that you loved this one so much is a huge recommendation. I think I need to get back into this world soon! Thanks for the encouragement. Did you know you can shorten your long links with AdFly and make money from every visitor to your short links.